Mozilla has debuted a new extension for its Firefox web browser that will track the price of certain online items and send you an alert when the price tag drops. Dubbed Price Wise, the browser add-on is currently available for anyone to test. 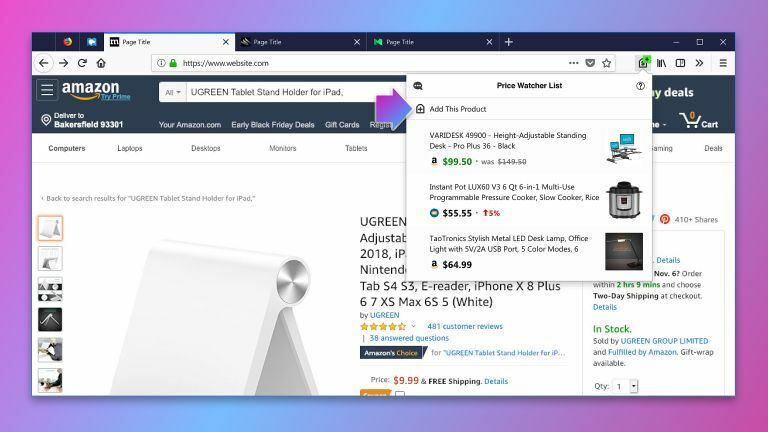 With the extension enabled, Firefox browser users will be able to begin tracking the price of items they're interested in with a quick tap on the Price Wise toolbar icon and only add the item to their basket when it drops to a price they're happy with. Since Price Wise is currently in beta testing, its tracking abilities are a little limited. The Firefox extension can only track the price of items listed on Amazon, Best Buy, Home Depot, eBay, and Walmart at the moment. However, more will be added in future. Granted, price tracking is nothing new. Services like CamelCamelCamel, which tracks price fluctuations of Amazon items over time, and web browser add-ons like Keepa, which shows price history charts for each Amazon page you visit, have already enjoyed immense success – especially ahead of major sales events like Prime Day and Black Friday. However, integrating this type of price-tracking functionality directly into the web browser means it could reach a much wider audience. Since Price Wise has just launched in beta, it doesn't have the same historical data that some its competitors have amassed over the years. But if you use Mozilla Firefox on your machine and have your eye on a few items for friends and family this Christmas (or to simply treat yourself) then it might be worth tagging them with Price Wise and seeing whether they drop in price this Black Friday. Price Wise is available in beta today via Mozilla’s Test Pilot site.